The start of each new season of Showtime's serial-killer drama, Dexter, has often been a reset from whatever intense and explosive murder and mayhem ensued at the end of the previous season. But Season 7 bucked that trend. With the sixth season leaving us hanging as Deb's mind processed the sight of her brother standing over the still-warm body of a man he just killed, the seventh season really had no choice but to follow up on what ensued in the moments that followed that amazing cliffhanger. And it did, with a flashback that caught us up and brought us into the stage of Dexter and his sister Deb's relationship that had her trying to understand the extent of his true nature and getting acquainted with his dark passenger while also getting her hands bloody in the process. This review contains some general updates on the status of the characters in the first few episodes of Season 8 of Dexter but I've done my best to avoid major spoilers. Deb's bloody hands bring us to the start of Season 8, with the first few episodes focusing on the aftermath of what Deb did at the end of Season 7. Faced with the choice of letting her brother get caught or protecting him by killing Maria LaGuerta, Deb chose the darker path, not only making the choice to become a murderer, but killing a cop in the process. The Deb from a few seasons ago wouldn't know herself if she was standing right there in that storage locker. A few months have passed since the incident and as the people of the Miami Metro police precinct honor LaGuerta's passing with a memorial service, Deb (Jennifer Carpenter) and Dexter (Michael C. Hall) are dealing with the murder the way you might expect. Dexter's mostly fine with it. LaGuerta didn't exactly fit the criteria of his code, but technically, he didn't kill her. In fact, if you recall, Dexter was prepared to hand himself over to his sister, dropping his knife and telling her, "Do whatcha gotta do," when she chose to shoot LaGuerta. That was her kill, and unsurprisingly, Deb's not dealing with it so well. That's really putting it mildly. She handed over her badge and has gone over to the private sector, working for a Private Investigator named Jacob Elroy, played by Sean Patrick Flanery. Her new job affords her a far less stable lifestyle than police work, and it gives her a more occupational track on which to stage her downward spiral. Suffice it to say, she's in bad shape, and she's keeping her distance from Dexter. Dexter, meanwhile, is moving through life and work as usual, spending time with Harrison - who actually talks sometimes, now - and working forensics at Miami Metro. While he's concerned about what his sister has gotten up to, he's downplaying her absence at work. But things take some interesting turns when he tries to reconnect with Deb, who wants nothing to do with him. And when Dr. Evelyn Vogel (Charlotte Rampling) arrives at Miami Metro, things get particularly interesting for Dexter . Vogel has a therapy background, specializing in serial killers. That in itself should send up red flags, but we soon learn that - big but previously revealed spoiler alert - she has a much more personal connection with Dexter, involving the code Harry imparted on his son before he died. Vogel and the code are a big part of what bring Dexter's story so much closer to its roots than we've ever seen before. Throughout the first seven seasons, we've seen Dexter exploring various sides of himself, whether it be as a boyfriend, a friend, a brother, a husband or a father. Dexter is constantly looking to other people to see what they might reflect in himself. Dr. Vogel's involvement in his life could be the mirror he needs to really see himself, for better or worse, and the one we need to better understand this character. Signs point toward that as the start of Season 7 pushes deep into the souls of both Dexter and Deb, forcing them to face the decisions they've made, and allowing us to explore their findings as this story draws to a close. There are all sorts of updates I could tell you about Batista (David Zayas), Masuka (C.S. Lee), Quinn (Desmond Harrington) and Jamie (Aimee Garcia), but I'm not going to spoil you on any of that. Their stories continue to offset some of the tension. And I will tease you with this: There are two very intriguing new relationships (not necessarily romantic) involving one or more of those characters. 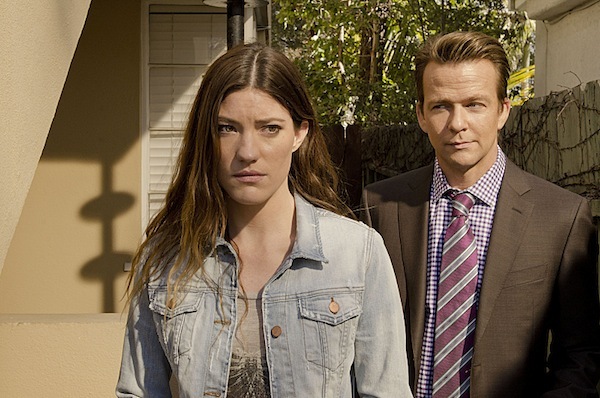 Changing the subject, it needs to be said that Jennifer Carpenter has some amazing and intense moments. Carpenter brings us right into Deb's downward spiral and forces us to look at what she's dealing with. We've seen Deb unraveled before, but not like this. Not like this. Dexter's been a thrilling ride and one of the more compelling dramas on television in the last decade. It lost some steam in its later seasons, but I think it brought some of that back with Season 7, and Season 8 stands the chance of living up to the standard set by the series when it was in its prime. At this point, I'm optimistic that this final chapter of Dexter's story will deliver a conclusion that's satisfying and thrilling, and also at least a little bit disturbing and bloody, because that's what we've come to know and love about this series. And signs point to this being an exciting final season as the first few episodes begin to build momentum and some great suspense, with the focus of the story dividing itself between Dexter and Deb as both of them are forced to look themselves in the mirror and try to come to grips with what they see. Dexter Season 8 premieres Sunday, June 30 at 9:00 p.m. ET/PT on Showtime.